Introduction: Iman Afroz Ali, a teacher from Seekers Guidance, Mt. Lewis, NSW, Australia and Founder and President of Al-Ghazzallorg Centre for Islamic Sciences and Human Development Sydney, Australia, was a distinguished guest speaker at the 3rd Annual World Conference on Riba at Kuala Lumpur, Malaysia during the last week of November 2012. His topic was titled "Social and Environmental Impacts of the Global Riba-based (Usury-based) Monetary System." In summary, Iman Afroz Ali, focused on how all around the world we are experiencing a New World Order plan that is designed to shift "local market" - small farm production to "global market" - corporate production. How many times have we heard the expression: "When you control the food, you control the nation!" Iman Afroz Ali shared examples of how small farmers (Fiji and Argentina) and fishermen (in the waters around the Philippines) are being exploited and degraded by big Agriculture and big Fishing corporations that qualify for riba-based (usury-based) loans while relying on government subsidies. According to Iman Afroz Ali, we have forgotten the human being In the pursuit profit. It is unfortunate that the real wealth is being usurped from the common people - driven by the GMO Agenda (Monsanto) and Agenda 21. 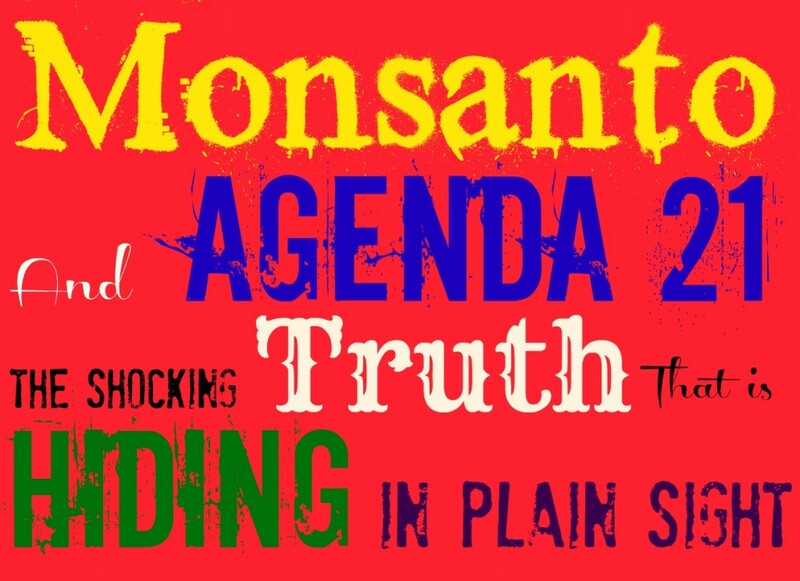 Indeed, it was timely that just this morning, a usuryfree creative forwarded me the article titled "Monsanto and Agenda 21: The Shocking Truth That Is Hiding In Plain Sight" authored by Melissa - from the blog "Unmistakably Food." I expect this post to get me criticized for being just another crazy right-winger spreading fear. (For the record, I’m not right or left wing). I also fully expect to loose subscribers over this post, so that should say something about how important I feel this information is. So let’s start at the beginning. Anyone who reads this blog knows how strongly I feel about sustainable and environmentally-friendly ways of life. Anyone who reads this blog also knows how anti-Monsanto I am. I am doing everything I can in every way I know how to fight Monsanto, because Monsanto is destroying our environment (not to mention human health), quite possibly beyond repair. Do you want to know the main reason I dismissed it? Because the video claims that the U.N. is working with world governments to control the world for the purpose of forcing environmental sustainability. Apparently George H. W. Bush signed us onto Agenda 21 in 1992. 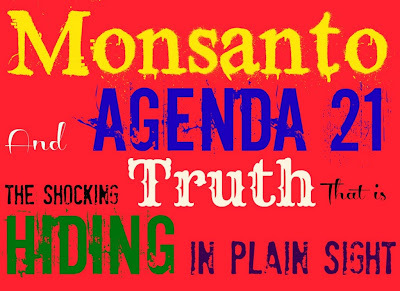 So if Agenda 21 is all about saving the environment, why is the U.S. Government so obviously supportive of Monsanto? “Even if Agenda 21 is for real, we’re not going to have to worry about it for a good long time, because right now everyone is pushing further development of GMO ‘biotechnology,’ which is anything but environmentally friendly,” I thought. One thing confused me though. In the video above, at 1:37, the “green goal” is referenced, in which is listed everything that will be done away with under the new world regime, things which Agenda 21 does not perceive to be “sustainable.” Included in this list are: commercial farms, herbicides, pesticides, irrigation, farmlands, pastures, and grazing of livestock. This list rules out both commercial agriculture (herbicides, pesticides, irrigation), and sustainable agriculture (farmlands, pastures, grazing of livestock). So how do they intend to feed everyone? It didn’t make sense, so I dismissed it. I wish I could say that was the end of it, but Agenda 21 kept popping up on my radar. Agenda 21 is the “agenda for the 21st century,” put together by the United Nations and signed by over 178 of the worlds’ governments. The original draft was and still is soft law, which means it is completely voluntary. It is a plan for “sustainable development,” agreed upon and signed at the United Nations meeting of 1992. George H.W. Bush signed the United States on at this time, and was able to do so without approval from Congress because Agenda 21 is soft law. During this U.N. meeting, specific plans of implementation were agreed upon and put into effect. In 2002, at the World Summit for Sustainable Development, progress was monitored and evaluated. Further implementation was put into effect. Agenda 21 has infiltrated our entire culture, without our awareness. Public programs that have anything to do with sustainability are almost always part of Agenda 21, including the Reduce, Re-use, Recycle movement, the movement to Go Green, and the phraze “Think Globally, Act Locally.” Here are a few more things that are part of Agenda 21: smart growth, government-subsidized housing, bike boulevards, neighborhood summits, and neighborhood revitalization and stabilization projects. The goal of Agenda 21 is to push farmers off their land, push people out of the country and into the city, push people out of privately owned-homes and into government-susidized housing, push people out of privately-owned cars and into public transportation or onto bikes, ect. The ultimate goal is to see the collapse of free market so that the wealth of developed countries can be distributed to developing countries. Also, to turn 50% of the world’s land mass into designated wilderness areas which will be untouched by human activity. These wilderness areas will be surrounded by buffer zones, and the remaining 25% of the land mass with be “human settlements,” where all the world’s population will be crammed into government housing, with quarters stacked for stories upon stories so as to use space responsibly. All of this will be done under the guise of sustainability: to stop the destruction of the environment that is caused by free market, urban sprawl, waste, and consumerism in developed countries that value individual rights. Crazy huh? Now can you see why I dismissed this at first? I decided to read the actual Agenda 21 documents for myself. Here’s what I found: The Agenda 21 documents lay out a detailed plan for the U.N., in cooperation with world governments, to be implemented globally, nationally, and locally. To be specific, the Agenda 21 documents lay out a very clear plan for government to slowly seize control of land, the water supply, energy, electricity, and all of the world’s resources, under the guise of making sure nothing goes to waste. It’s all written as if the writers have the best interest of humans and the environment at heart, but humans under this plan would have no liberty and no rights other than basic rights such as food and shelter (hence the government-subsidized housing.) This is very obviously socialism/communism. I haven’t read the entire documents yet, and I can’t substantiate all the claims that can be found on the internet. I have seen references to “human settlements” and “designated wilderness areas,” but no details yet on how these things would be implemented. To read the documents for yourself, click here for Division for Sustainable Development Agenda 21 or here for the Draft International Covenant on Environment and Development. Reading all of these things for myself was scary, I’ll be honest. On the one hand, I absolutely know that the environment cannot continue to sustain urban sprawl, consumerism, pollution from cars and materials used to build homes, and the waste of energy and resources by developed countries. That’s why I have been working literally around the clock on this blog, in the hopes of effecting change on the individual level. The last thing I want is for sustainability to be forced on everyone by the government. We have history to show us what happens when people are enslaved by the government. It’s hard to believe that something like this could happen again, here in Amercia, the Land of the Free. When I went to read the documents I was hoping to have these fears put to rest – to see that as usual, things read on the internet had been exaggerated. Instead, I saw what is happening in the world right before my eyes carefully planned out in a 1992 document written by the U.N. Farmers ARE being pushed off their land. People ARE loosing their homes. Government-subsidized housing IS being built in certain areas. Small businesses have been closing for years, but now we have large businesses also closing their doors. Our free market has become very unstable. All of these things could just be coincidence, of course, and that’s what I kept telling myself. “After all…Monsanto,” I would remind myself. Monsanto is the exact opposite of sustainable farming. It’s a menace to environmental sustainability, and our government endorses it. And that’s when it all came together in my mind. It dawned on me this morning and I decided to jump ahead in my reading. I scanned the Agenda 21 chapter titles, looking for something I desperately hoped I would not find. But find it I did: Agenda 21, Chapter 16: Environmentally Sound Management of Biotechnology. Anyone who knows anything about Monsanto can back me up. Biotechnology is the word Monsanto uses to refer to their practices of genetic modification. I bolded all the areas that are obvious references to GMOs. You can read the entire chapter here. Apparently the U.N.’s plan to save the environment includes “sustainable” GMO biotechnology. How can this be possible? Because GMOs need less water and less nutrients. They yield far more result per acre than non-GMO crops. They don’t require use of pesticides and herbicides, because, well, they ARE their own pesticide. (One bite of GMO corn will kill pests.) This is Agenda 21′s plan to feed the world without pesticides, herbicides, farmland, pastures, or grazing of livestock. This is Agenda 21′s plan for sustainable development, for saving and reversing damage done to our environment, for preserving the world for future generations. This is why our government is pushing GMOs, why elected officials have appionted former Monsanto-employees to prominent places in the FDA and ect. This is why it seems the powers that be are hell-bent on advancing GMO biotechnology. It’s all part of Agenda 21. Agenda 21 is real, it is in effect, and it will not be voluntary forever. I’ll tell you one thing. I am all for sustainable agriculture, but Agenda 21 and I have very different ideas of what defines “sustainable agriculture.” We need to fight Agenda 21 right now, while we still can! 1. Share this Information With Everyone You Know! Share this post if you want to. I’ve made it easy to understand by explaining everything as clearly as I can, and using sources to back up what I’m saying, including links to the actual documents. I’m sure there are others who have connected the dots between Monsanto and Agenda 21, but they are probably few and far between. Our greatest weapon right now is to spread information. People need to know what is going on. We still live in a free country and we cannot take for granted our ability to fight for a safe, free, and healthy life for our children. I thought we were going up against huge odds before when it was just Monsanto, but now I know that the odds are astronomical. PLEASE HELP ME SPREAD THE WORD! 2. Fight Agenda 21 at the Local Level! I said it above and I’ll say it again: We still live in a free country. We have a choice as to whether or not Agenda 21 is adopted into our communities. Now, while it is still soft law and voluntary, we need to fight it! Pay attention to what is going on in your local elections, find out whether your community has adopted Agenda 21, and what their plan for implementation is. 3. Continue to Spread the Word About True Sustainable Living. On the one hand, destruction of our environment and waste of our resources absolutely cannot continue. Taking away human freedom to force environmental sustainability is also not the answer. Especially becauseMonsanto is not sustainable agriculture. What we need is people to choose, on their own, to live in environmentally responsible ways. We need to fight to keep our small farmers in business. 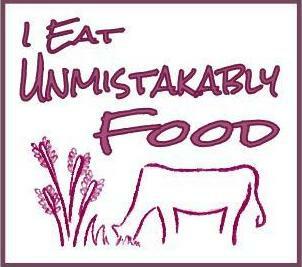 True, old-fashioned sustainable farming will save our environment. Local farmers need our support now more than ever before, because they are going up against Monsanto and Agenda 21! We can support them with our money and votes. Let’s keep our small farmers in business.Together, we can do this but we need all of us! Help me spread the word! NOTE: be sure to read the comments posted by readers at the end of the original article at the above link. NOTE: This article is also posted at "A Sheep No More's" page here at Facebook - complete with an abundance of comments by readers. NOTE: Michael Astera's website "Soil Minerals" offers essential information for people growing their own food.